The sight of a surgeon playing "Grand Theft Auto" in the operating room might raise eyebrows, but it's one example of how consumer technology is being repurposed to advance the practice of medicine. Rising medical costs -- bloated by expensive, complicated machines -- are wrecking the nation's economic health, while off-the-shelf consumer gadgets keep getting cheaper and more powerful. So the health care industry has discovered it can tap into the innovative wonders of an Xbox 360 or PlayStation 3 or an Android smartphone app. 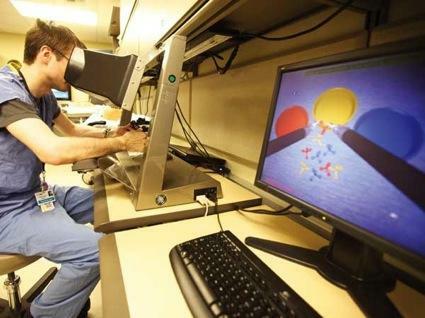 Dr. Tom Lendvay, assistant professor of urology at the University of Washington, has studied whether warming up on a virtual reality simulator can improve a surgeon's performance on the operating table, and he now plans to study whether video games could also put a surgeon in the zone. Lendvay's simulator mimics the da Vinci surgical robot that many surgeons now use to perform laparoscopic surgery. Warming up reduces errors, Lendvay thinks, by jump-starting the centers of a surgeon's brain responsible for memory, spatial relations and motor skills -- all critical for using the surgical robot. The problem with simulators is that they're too expensive to put outside every operating room. An Xbox 360 or PlayStation 3 is not. That’s why Lendvay wants to know whether a session of "Mortal Kombat" or some other game is a worthy alternative to warming up on a simulator. "If you can pay for a video game versus $100,000 for a simulator," Lendvay said, "that's all you need to know." Another cost-saving adaptation of gaming technology helps Dr. Brian Ross train medical students. Ross is executive director of the Institute for Simulation and Interprofessional Studies (ISIS) at the UW. The institute uses simulation technologies to teach medical skills, as well as to deliver instruction in fields such as business, bioengineering and computer science. The challenge for Ross and other medical faculty is that the UW is the only medical school in a five-state region -- Washington, Wyoming, Alaska, Montana and Idaho. That has made the UW a leader in practicing telemedicine because many students spend much of medical school at hospitals in their home states. Because the hardware and software necessary to interact electronically with students is expensive, Ross set out to find a cheaper alternative. He found it when he noticed his son sitting in front of his Xbox wearing a headset that enabled him to banter with the other players participating in an online game. By adding a camera to one console at each end, Ross realized he could turn two Xboxes into a video conferencing system that costs several hundred dollars instead of several thousand dollars for licensing, equipment and tech support. Ross used the system to show a group of students in Boise how to install a breathing tube, and has been using it for other training sessions ever since. Ross wants to take his Xbox adaptation beyond video conferencing. He hopes to find a game engine developer or two that would be interested in creating virtual medical environments, such as emergency rooms, where students and doctors in different locations could train online through avatars -- i.e., digital characters -- representing each user. Kinect's motion sensors -- which enable Xbox users to control the actions of their characters through their own movements and gestures -- could turn a virtual emergency room into a "very realistic" learning environment, Ross said. 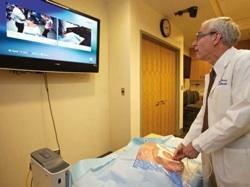 Launched by Microsoft last year, Kinect is generating as much buzz in the world of medicine as it is among gamers. Search the internet for examples of Kinect being hacked in the name of medical science, and a long list of adaptations appears. "It's a really great product where there's a lot of opportunities to do a lot of things," says Howard Chizeck, an electrical engineering professor in the UW's Biorobotics Lab. "It's a very enabling device. It's the right thing at the right time." A hospital in Toronto, for example, is using Kinect to allow surgeons to make hand gestures to control imaging systems while they operate. This eliminates the need for surgeons to leave the sterile field around the operating table whenever they want to pull up images from an MRI or CT scan. The time they save reduces costly delays. The UW Biorobotics Laboratory is tinkering with Kinect to solve a different problem. When using surgical robots, surgeons are unable to feel what they’re suturing or cutting. They are guided solely by two-dimensional images on a monitor. Because surgeons can't feel what they’re doing, they run a greater risk of damaging surrounding tissue. While it’s possible to put sensors at the tip of a surgical robot’s instruments, Chizeck said, they are expensive and difficult to keep sterile. Kinect's motion sensor technology provides a way to create three-dimensional models of patients that can be engineered to provide resistance feedback through the controls that guide the surgical instruments. Fredrik Ryden, a graduate student, is working with Chizeck and another electrical engineering professor, Blake Hannaford, to advance this approach. 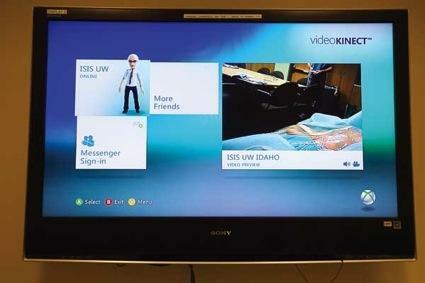 Any such system that ultimately makes it to the operating room may or may not integrate Kinect’s technology, but it will be based on research Kinect supported. "Kinect gives us a really low-cost test bed for developing and testing the idea," Chizeck said. Dr. David Loren is an assistant professor of pediatrics at the UW. One of the most important skills he must teach his students is how to interpret and process what they hear on a stethoscope. Before school starts this fall, Loren will have a new tool at his disposal -- an electronic stethoscope that uses an Android cellphone app to allow people wearing Bluetooth headsets to listen to the same sounds as the stethoscope's user. "Students will hear what I hear at the same time I hear it, and I can talk about it with them in real time," he said. "It allows me to share not just what I'm hearing, but what I'm thinking." The advantages of the new stethoscope extend beyond teaching students. In many cases, more than one doctor is involved in caring for the same patient, but they aren't in the same location. Now, everyone can listen to the same thing at the same time, which could improve the decision-making process. "To me," Loren said, "it's a quantum leap."